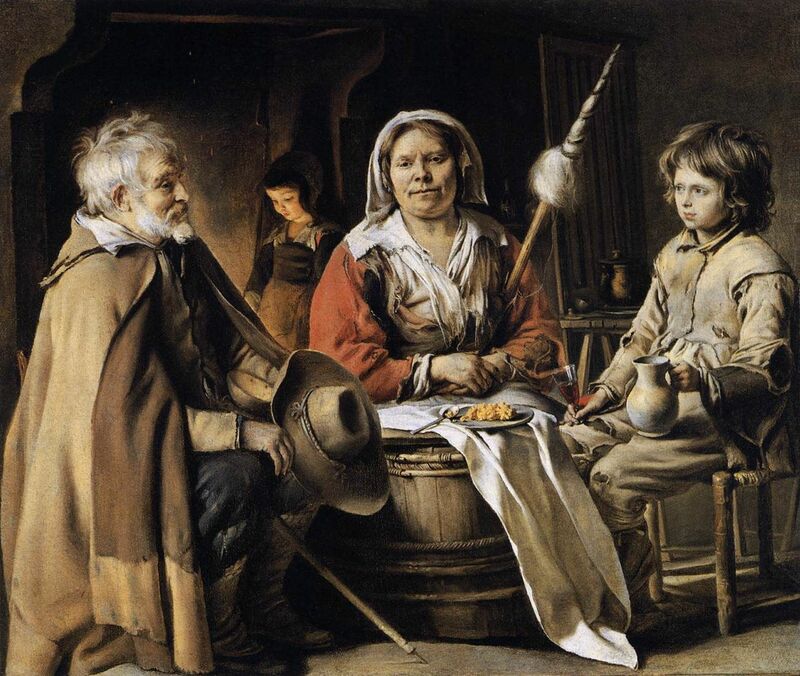 OK, I am drawn to rustic 17th century interior scenes. I find the delicate glass goblet almost funny in the very down to earth picture. And while they have food on the “table” and wine in the glass the clothing is in bad shape. What, no bird cage? And is that a girl tending a fire in the background? Hey- at least the man has a cloak, hat, and a smile on his face- and all without federal aid! Yes, she is. It is called child labor, someone had to cook the scrambled eggs (that’s what they look like to me). Thanks for this one. I love them all, but as I love spinning and weaving and researching them historically, I love the old pictures with these items in them. I so wish they had the spindle in view to go with the distaff so we could see what it looked like. It has to be flax she is spinning, and I would guess if we could get her to move her hands it is tucked in her waist while she takes a short break to eat. Women could spend up to 80% of their time in the past just in trying to provide for the clothing and cloth needs of their families by spinning and weaving. I would like to guess that the mother here is needing to get a lot done and the daughter is helping out with the other household goods. The daughter probably is a decent spinner herself already but as the mother is much better, she could get more done more quickly so is at it at all times with her daughter’s help in the other areas of home care. I do love putting a story to these pictures. I’m drawn to the almost photographic quality of the portrayal of the faces, particularly the woman’s. Thanks for reminding us of the great skill and talent exhibited by these artists!